‘actioni contrariam semper et aequalem esse reactionem: sive corporum duorum actiones in se mutuo semper esse aequales et in partes contrarias dirigi (Newton 1726, 14)’ (‘to every action there is always an equal and opposite reaction: or the forces of two bodies on each other are always equal and are directed in opposite directions’). What is the relationship between oil, welfare and war? Does the absence of oil in a national territory inevitably lead to tensions, political conflicts and wars abroad? 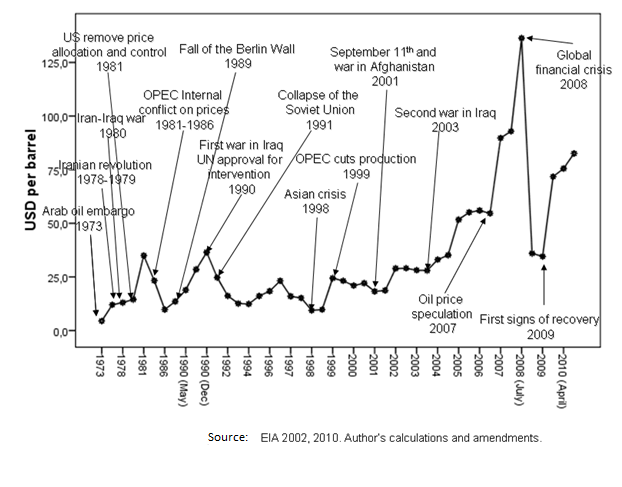 And, even more importantly, what is the role that oil prices and oil price cycles play in this process? While oil is a crucial resource able to trigger important economic, political and societal changes (such as fast industrialization, see the “oil revolution” in my previous blog), it also represents a source of constant conflicts. Its price cycles influence the destiny of both producing and non-producing countries. In 2006, Friedman (2006) postulated The First Law of Petropolitics according to which ‘The price of oil and the pace of freedom always move in opposite directions in oil-rich petrolist states’. To put it in other words, the higher the price of oil, the higher the chances that an authoritarian regime will not feel threatened by external influences, and will, therefore, more easily reject pressures for democratization. Subsequently, this means that when oil prices are low, the economies of non-oil producing countries flourish, but this at the expense of producing countries. 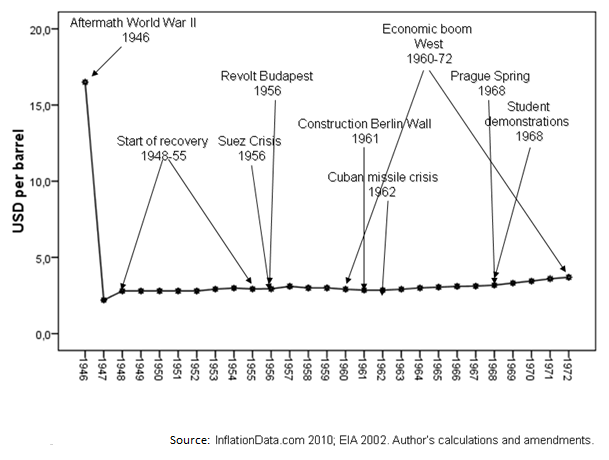 This is the case of the post-World War II recovery period, where oil prices were, until the late 1960s, below the threshold of 5$ a barrel. Similarly, when crude oil prices are high, the economies of producing countries witness unprecedented surplus in budget, but this at the expenses of non-oil producing countries. This is the case of the 1970s economic boom, where oil prices jumped up to 22$ in 1979. Overall, it is safe to affirm that the availability of oil in one’s own territory does not necessarily hamper economic and social progress, but it almost, unambiguously, triggers an authoritarian turn due to ‘rentier state’- related mechanisms that favor the implementation of an authoritarian management of resources. This can be explained by an increasing ‘capture’ of the economy, of the political regime, of the welfare system and of the society (see Cerami 2009)1. This is, for example, the case of Gaddafi’s Libya, Ben Ali’s Tunisia, Mubarak’s Egypt, Assad’s Syria, Saddam’s Iraq, Hugo Chavez’ Venezuela, Houphouet-Boigny’s Cote d’Ivoire, and Abubakar Tafawa Balewa’s Nigeria. Similarly, however, the non- or low availability of oil in one’s own territory forces governments to ensure a direct access to the resource elsewhere so as to avoid the potential negative impact of high oil prices and of international speculation. This triggers tensions that can easily turn into conflicts. This is, for example, the case of the Suez Crisis in 1956, or, as battles for the acquisition of further wealth, the cases of the Iran-Iraq War in 1980, as well as of Saddam Hussein’s invasion of Kuwait in 1990 (see Fig. 1 and Fig. 2). However, once wars are started, the international prestige and human rights achievements of more consolidated democracies are seriously damaged and with these the notion of an implicit superiority of democracy is also called into question. Paradoxically, engaging in wars with the sole aim of ensuring access to oil has no real positive effect in Western democracies, though it often benefits oil firms. Oil prices increase, the country’s financial situation of non-oil producing countries worsens, while, indirectly, the economy of their counterparts grows. This is, for example, the case of subsequent conflicts and tensions for oil in the Middle East and in the Commonwealth of Independent States in the 1990s and 2000s (see Fig. 1 and Fig. 2). 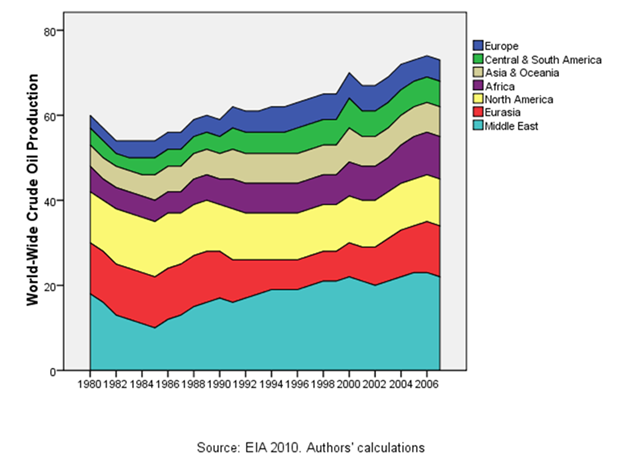 In turn, oil producing countries do not only see their national integrity constantly endangered by interventions in their own or in neighbouring countries, as in the case of Qatar, Iraq, Saudi Arabia and Russian Federation, but they are also called to engage in an exponential increase in military expenses, which necessarily lead to further escalation in armaments and tensions. As a result, the world economies stagnate, while further tensions and possibility of wars are constantly created. 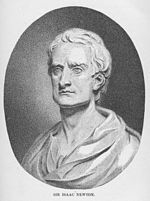 ‘to every action there is always an equal and opposite reaction: or the forces of two bodies on each other are always equal and are directed in opposite directions’. This means that when oil prices are high oil producing countries (such as OPEC countries) benefit but this will trigger further equal and opposite reactions from non-oil producing countries with the aim of re-establishing the previous equilibrium. Similarly, when the oil prices are too low, oil producing countries will face similar financial constraints and will, thus, retaliate against non-oil producing countries in order to re-establish previous high prices. This is a clear case of ‘double contingency’ but also of ‘double vulnerability’. The ‘adversaries’ look at each other trying to pre-empt the other’s moves, but this happens under imperfect information of the other’s vulnerability, which makes a negative turn in fortune only a matter of time. 1Cerami, A. (2009). Welfare State Developments in the Russian Federation: Oil-Led Social Policy and the ‘Russian Miracle’. Social Policy & Administration, Vol. 43, no. 2, 105-120.